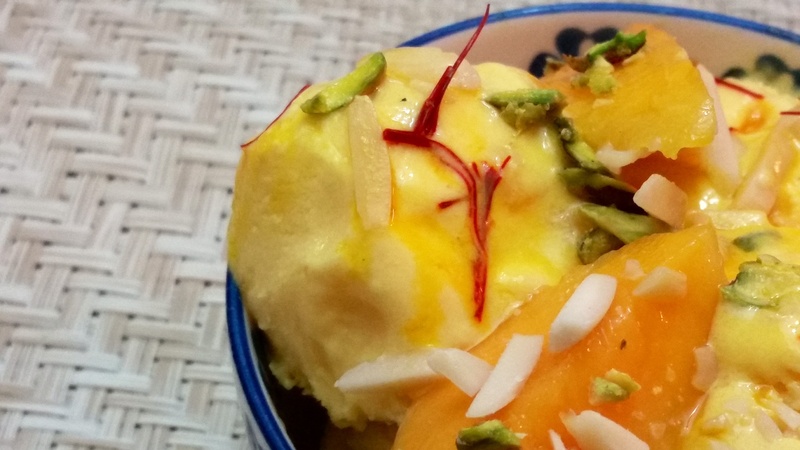 When luscious sweet mangoes tango with thick creamy Greek Yoghurt to the music of a warm saffron sauce, the pistachios & almonds sing in delight….Mmmm can life get any sweeter! A couple of cardamom pods. Peel, slice and purée the fresh mangoes with the Greek yoghurt and the canned mango pulp. Add sugar as needed. If the mangoes are very sweet you might want to add a squeeze of lemon juice to brighten the flavors. Pour into chilled container of the ice-cream maker and churn for 15-20 minutes. After 10 minutes, stop ice-cream maker, scrape sides and restart. 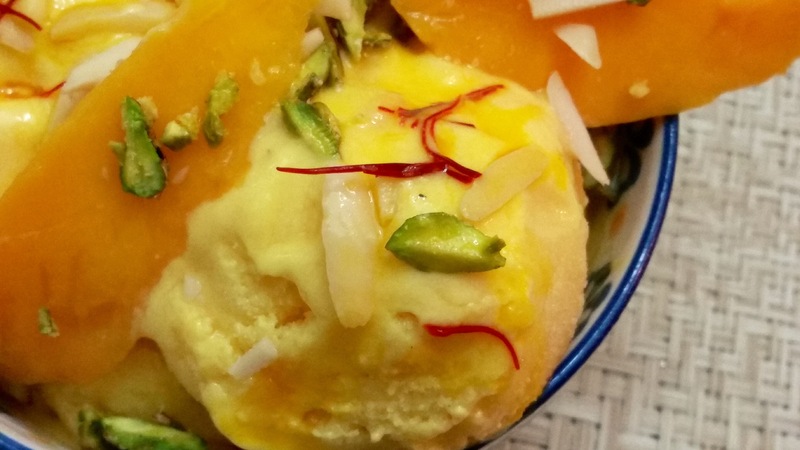 Towards the last 5 minutes, slowly add the mango bits, with the ice-cream maker still running. Remove into air tight container and chill for 2 hours. 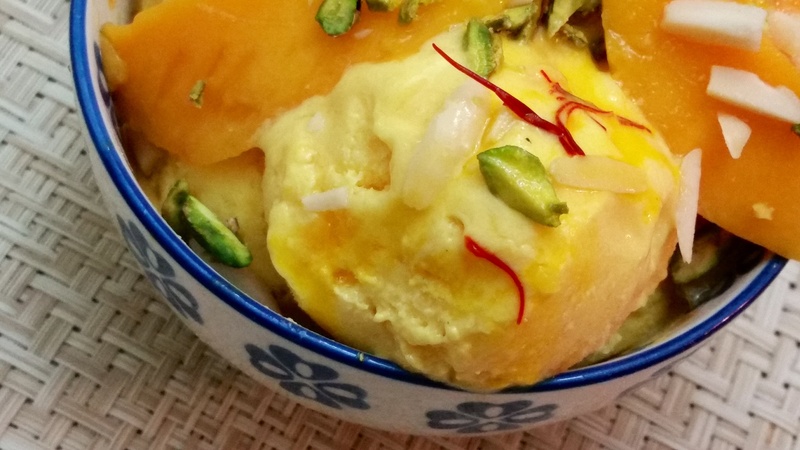 Take the frozen yoghurt out of the freezer, about 15-20 minutes before serving. Scoop out into serving bowls. Drizzle warm saffron sauce and sliced almonds and pistachios…serve immediately! Heat a tbsp of water with a hefty pinch of saffron, 1/4 tsp ground cardamom and a tsp of sugar. Use as needed! 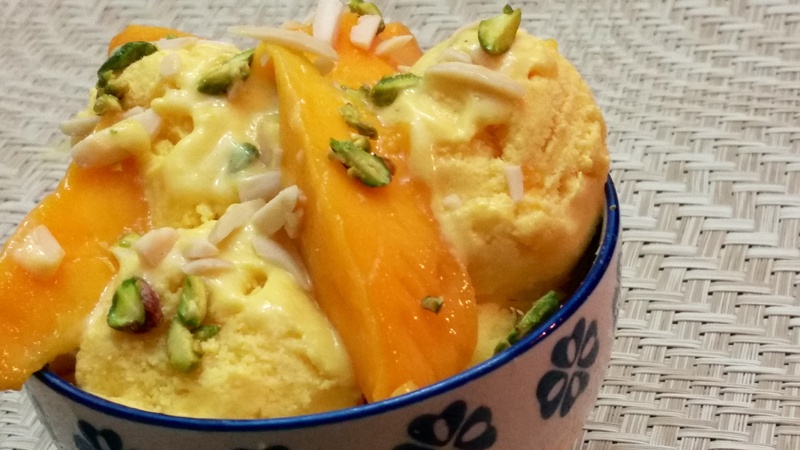 PS: if mangoes are not in season…you can skip using fresh mango pulp. Just increase quantity of mango pulp slightly, according to your personal taste.